Add 2 Klass full spoons to a glass of every cold water (8 oz) and stir to disolve. Add 9 Klass full spoons to a liter (1.1 qts) of very cold water and stir to dissolve. Serve over ice or refrigerate. 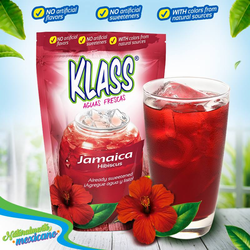 You can make delicious frozen popsicles with Klass Mexican flavors. Polvo instantaneo para bebidas. Agua de Jamaica.